Galtybeg is the 42nd highest place in Ireland. 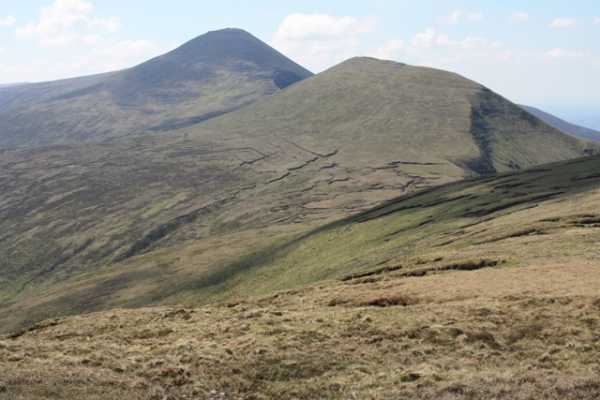 Galtybeg is the third highest point in county Tipperary. As of May 2010 signs have gone up at these access points requesting no dogs be brought on the Mountain. The Black road route could be called the "tourist route" and is the most popular as it is a rocky, easy to follow track all the way to a "Y" in the track as you reach a stone cairn at R89345 23482 C (Point D) (h637m), go left here and follow the stoney track which becomes badly eroded mud, crossing to the col between Galtymore and Galtybeg, then turn right up to the summit. You may also carry on past the stone cairn, after about 500 meters the stoney track ends and then you need to cross the bog, skirting peat hags(try to stay high and to the left of them) to the col overlooking Borheen lough , look out for the benchmark at R89476 24164 D and close beside it (look out for the gap between two rocky outcrops)the start of an easy track down to the lake on its west side.Turn left here and ascend to the summit. From Clydagh the traditional route is a magnificent circuit taking Cush and Galtybeg in as well, this is however a fair test of stamina so be prepared. 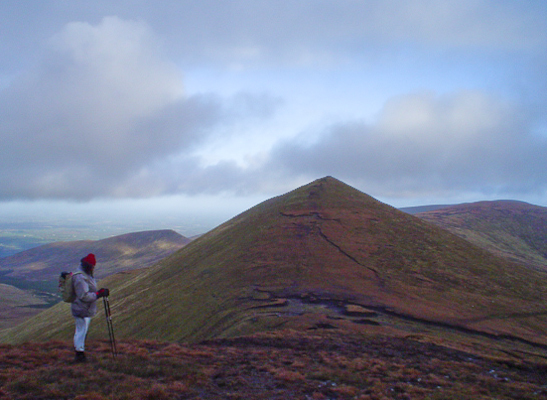 St Stephens Day seems to draw folk to climb Galtymore. 2004 saw the first truly white christmas than I can remember, so we had to head for the mountains. We arrived (after much slipping on icy roads ) and started up the black road at 9.20 am. The morning promised so much and Galtymore was fairly clear all the way up to the end of the black road then suddenly we were covered in cloud and the wind rose.This held all the way up Galtymore and most of the ways back down again with very few breaks.On the summit we got out the trangia and had tea and mince pies . Going back down was a battle to stay vertical with snow covering rocks and bogholes. 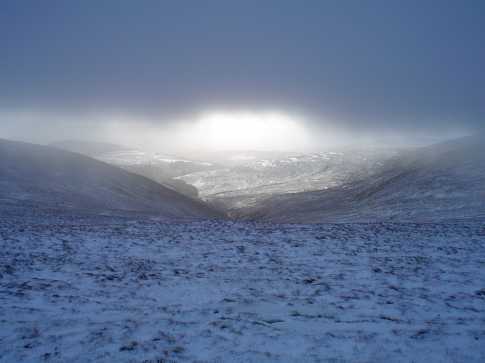 I had to wonder at the number of people climbing in all sorts of clothing (reflector jackets/jeans/runners) who asked us was it "much further to the top" or " which way is Galtymore" in freezing conditions with 20/30 mtrs visibility. But anyway what a great days walking - thoroughly enjoyable!!!! 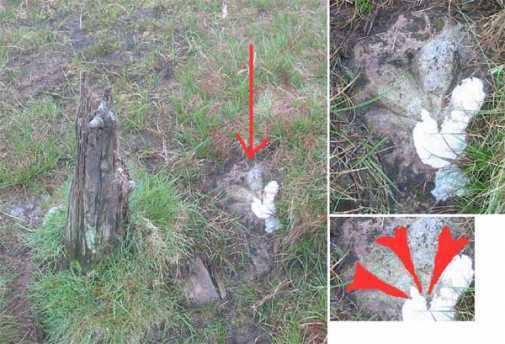 Picture from john_desmond : Ordnance Survey Benchmark??? Now, after this, you head West keeping the steep drop on your right as you walk the 0.5 km or so to the top. 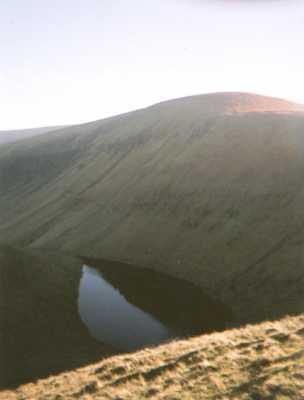 From there, you can retrace your footsteps, or take the steeper more direct route back to the dirt road or carry on West to begin the ascent of Galtymore.